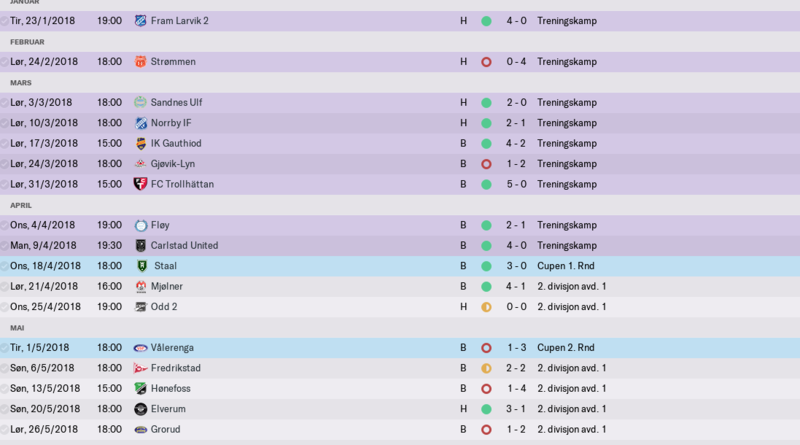 I will try to get Fram Larvik back to Tippeligaen, and even win it again. They won it the only time back in 1950. Say hello to the manager. Patrick Johansen have a huge task in front of him, to try and climb the divisions with Fram Larvik. His stats are not the best, but he have decent discipline (12). The squad is already getting tired, and Mr. Johansen is not sure what to do until the next transfer window. Maybe try to get up some youngsters from the u19 team.. 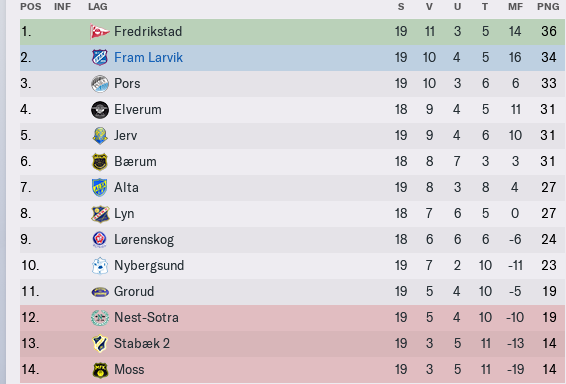 It seems like everytime Fram Larvik have a winning streak, they go on losses after losses, but suddenly, they have started to win games, and scoring a lot of goals as well! The biggest plus in their squad must be the striker Stian Dyngeland. 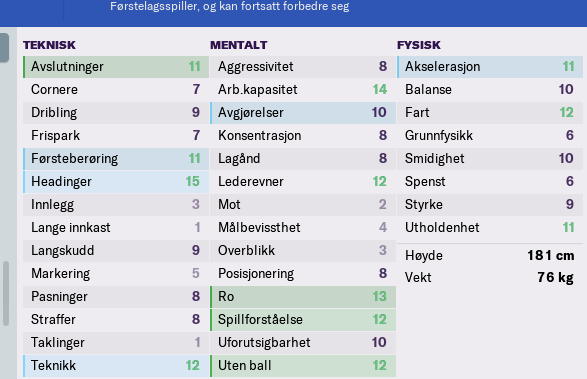 With 10 goals in 14 games he has become a key player in Johansen's squad, and also in the second place on the topscorer list. 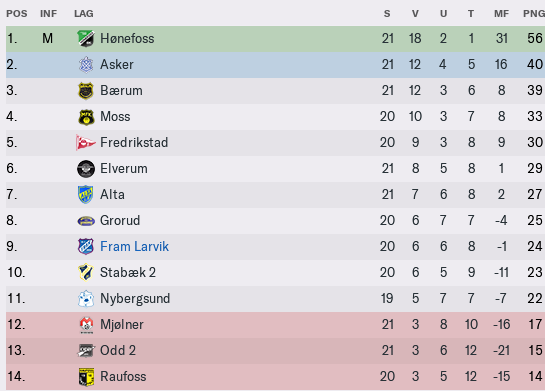 Hønefoss have already won the league, 5 games early. Suddenly it has all turned around for Fram Larvik and Patrick Johansen. They finish the season very strong, and ends up at 4th place. All in all a very good season, and maybe they can even climb more next season. 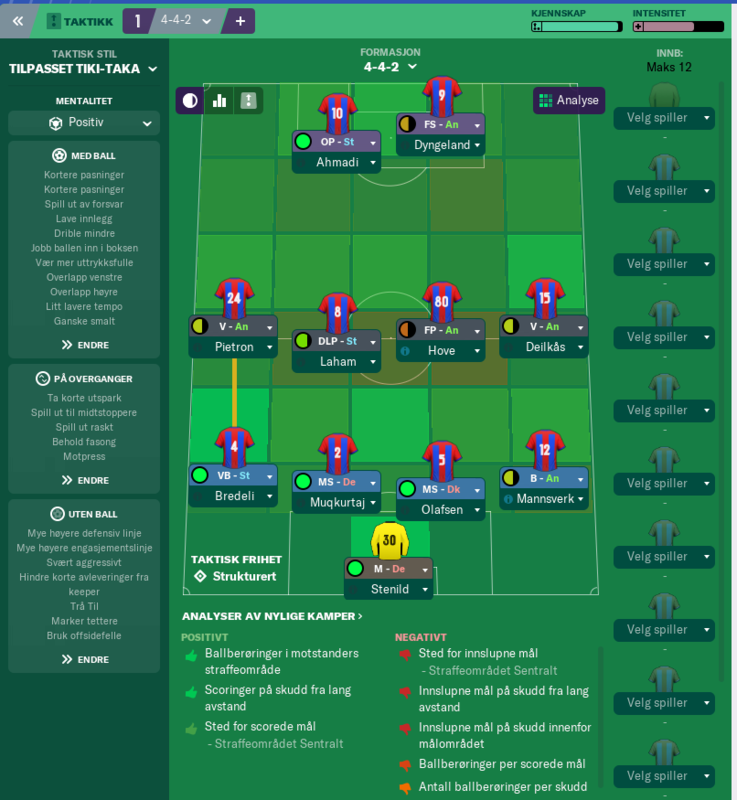 It all depends on their topscorer Stian Dyngland, with a fantastic 16 goals in 25 games, he will be very important for the future of Fram Larvik. The rumours say they will bring in more good players, on loan and on free transfer for the next season. Exciting times ahead on Fram Stadion. 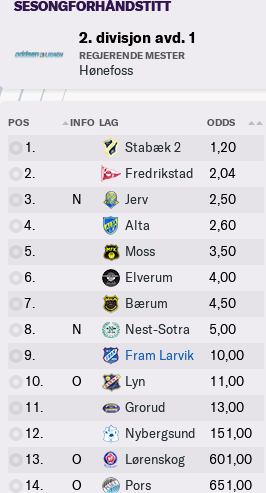 A good start, a save in Norway will be really interesting to follow, best of luck! Fram Larvik is preparing for a second season under Patrick Johansen, and it is starting to look better already. Some interesting players have been brought in for the new season..
A good start for the players from Larvik. 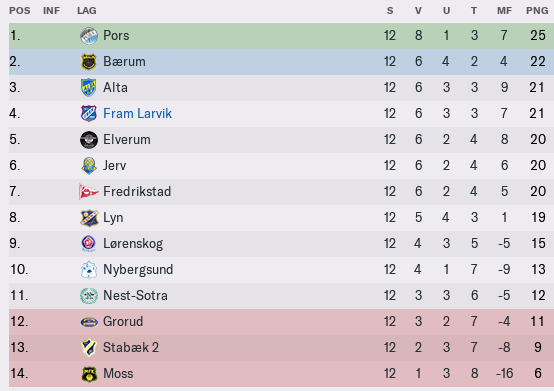 12 points in 6 games, and it looks like this season is gonna be a close race already! 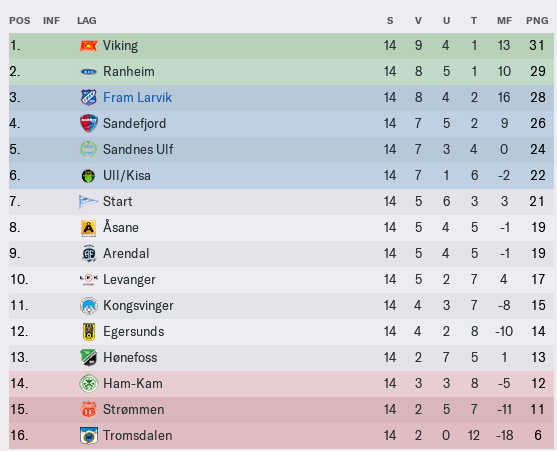 Fram Larvik is not in their best form, a lot of draws, BUT, take a look at the table. Everyone is beating everyone, it is really crazy to follow the Second division this season! The season is coming to an end, and it's still wide open. Who will win the league? 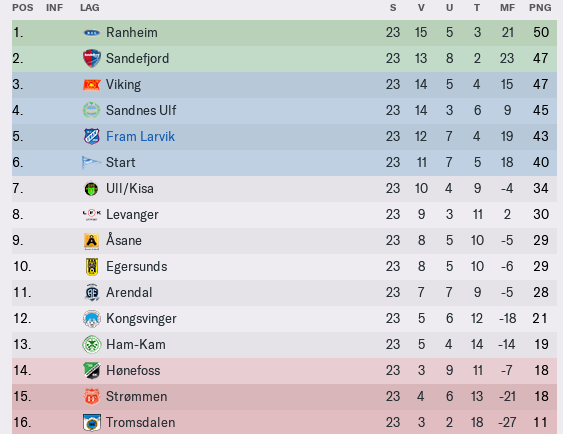 After the very important game against Fredrikstad, the league title now stands between 3 teams. 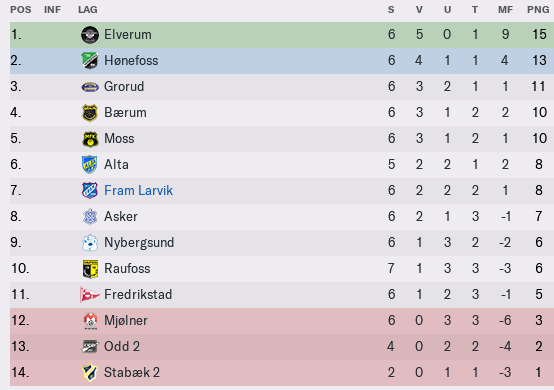 Fram Larvik and Fredrikstad on 44 points, while Elverum is on 3rd with 43 points. The next season will be interesting for sure! 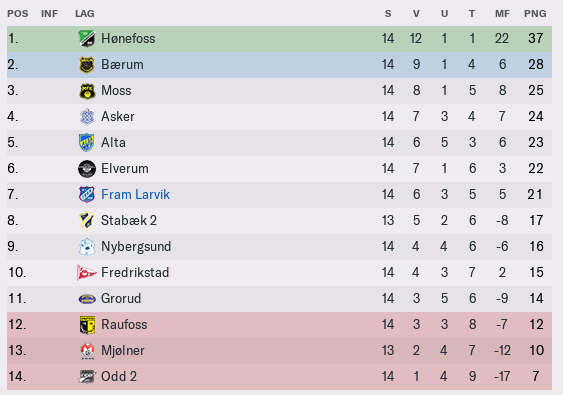 the second level in Norway will be tough, the ''OBOS-Ligaen'' will not be easy for the guys from Larvik, but I'm sure they are looking forward to play against bigger clubs. 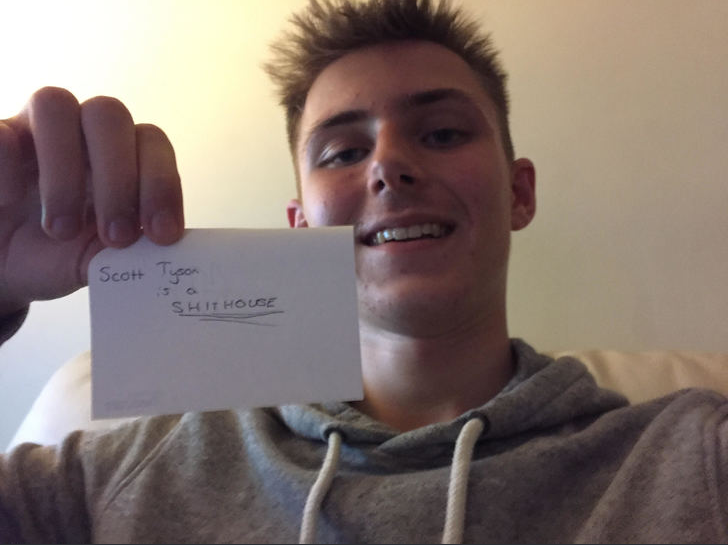 A huge congratulations on winning the title and securing promotion! Major achievement and the step up in opposition quality will be a testament to all achieved at the club so far. I have to say, I got very lucky haha The next season will be much tougher for sure..
Great season and congratulations. Best of luck for next season! Congratulations, let the promotion party begin! The new season is on the way, and more players have walked in the gates of Fram Stadion. 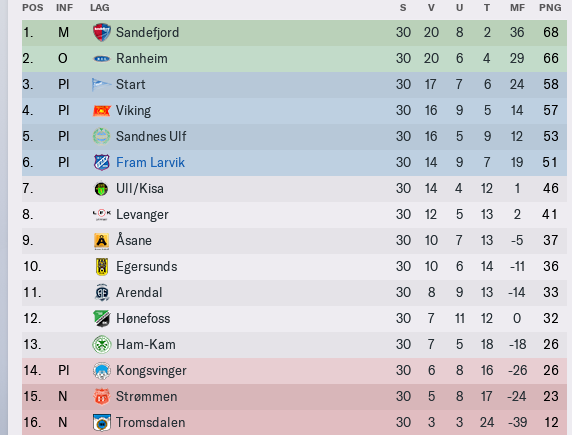 The experts have no faith in Fram Larvik this season, so they will fight the odds and prove everyone wrong. 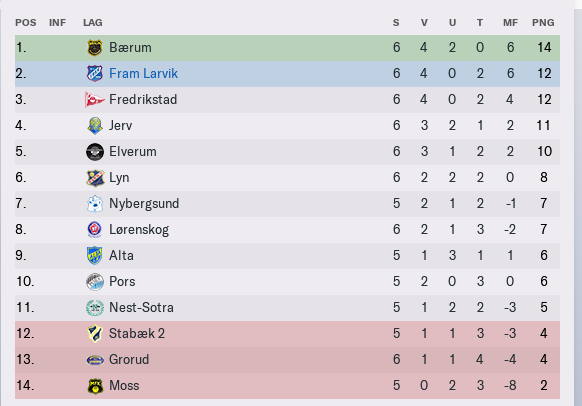 a VERY good start for Fram Larvik this season. Most teams seems to underestimate them. With 16 points on 7 games they are up on a solid 2th place. 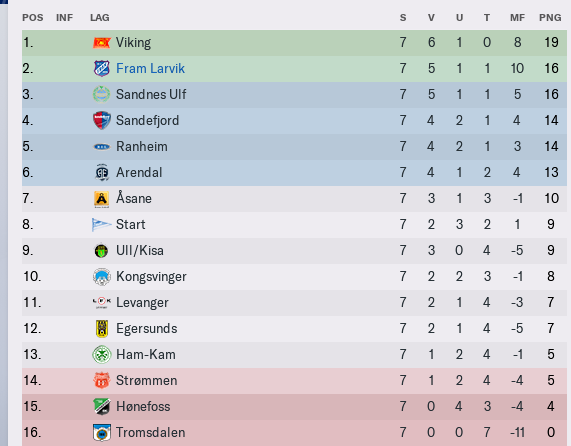 The season is almost halfway and Fram Larvik are still fighting for promotion. Can they go all the way already this season? 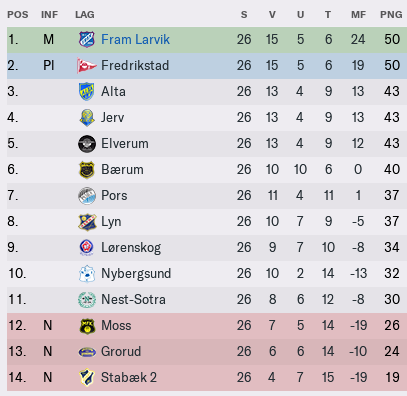 The season for Fram Larvik ends up very good, despite having a bad period at the end of the season. 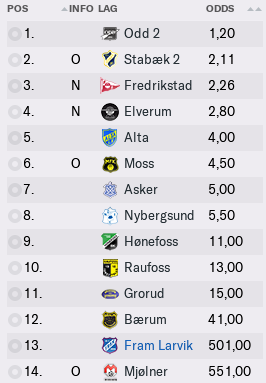 With a 6th place in the league, they can still try to win the qualifying for Tippeligaen. 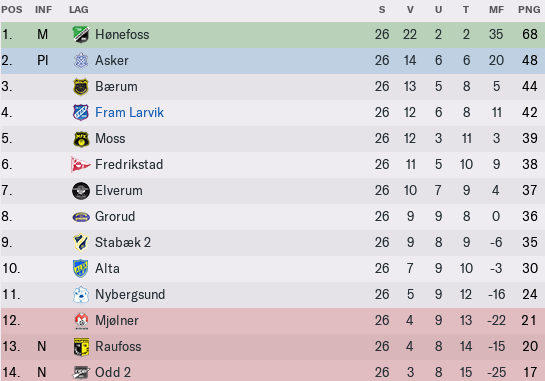 After a tough game against Start, the dream of playing Tippeligaen was over, for this season. Fram Larvik will come back strong next season, and keep on surprising everyone. He has to use his scouts even better for next season, and try to find the players that can lift his team even higher. Fantastic start to life in a new division! You'll be back bigger and better than ever next season! You are reading "The road to glory - Fram Larvik".